Ang Lee is an artist – a true film innovator. So even when his reach exceeds his grasp, you can't help cheering his effort. 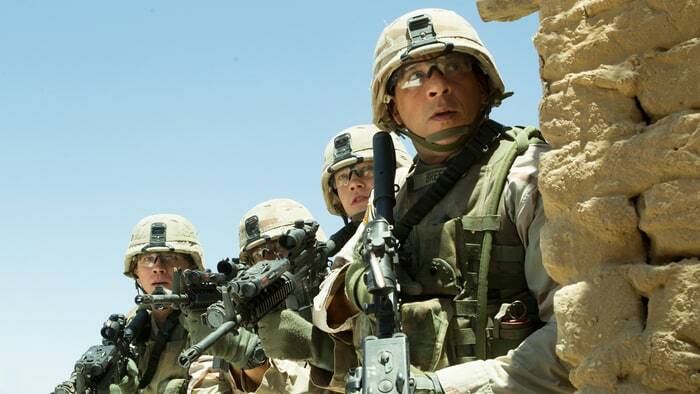 Such is the case with Billy Lynn's Long Halftime Walk, an Iraq war movie that two-time Oscar winner Lee (Brokeback Mountain, Life of Pi) has chosen to shoot in 3D with a frame rate of 120 frame per second, about five times the industry standard. Why? I have my theories. Ben Fountain's 2012 novel, far funnier and more biting than the tame screenplay by Jean-Christophe Castelli, offers an opportunity for a striking contrast. There's Army Specialist Billy Lynn, a 19-year-old Texan nicely played by British newcomer Joe Alwyn, proving himself a war hero by rushing to the aid of his injured sergeant, Shroom (Vin Diesel, over his head). We know this because someone captured the deed on a cell phone. Then there's Billy reluctantly participating in a two-week victory tour with the other surviving members of his Bravo squad, the big moment in terms of optics being a televised celebration with Destiny's Child at a 2004 NFL Thanksgiving halftime show. By filming the battle scenes with the same hyperclarity as the football spectacle, Lee could show how Hollywood fantasy and harsh reality have blended into the same pixelated entertainment junk food. It sounds promising, but in practice the effect feels gimmicky and distancing. Owners of new HDTVs call it the "soap-opera effect," a motion-smoothing function that makes movies look like video, free of shadows and texture. Most cinema addicts shut the damn thing off. Lee leaves it on, even when his film strays from Iraq and halftime to show Billy dealing with family, friends and fellow soldiers. Kristen Stewart has piercing moments as Billy's sister Kathryn, a peacenik who begs him not to redeploy. And Garrett Hedlund practically steals the movie in a revelatory performance as Sgt. Dime, a military lifer who wants Billy to stay the course. There's a minefield of clichés in the script and Hedlund dodges every one. In a crucial confrontation, the home team's owner (a calculating, sleazily compelling Steve Martin) tries to hustle a deal for a movie that's more Billy than Bravo Squad. The kid shuts him down with a response that gives Alwyn a chance to shine. Would we not feel close to Billy’s confusion at less than 120 frames per second? Would we not feel his betrayal when a cheerleader (a terrific Makenzie Leigh) tells him it's the uniform that makes him hot? Would not feel the shock when the halftime staff treats these soldiers as commodities and less than human? In truth, I think we'd feel more. The film's technical achievements are indisputable (a military salute to camera wiz John Toll). But Billy Lynn comes off as artificial when we most need it to be natural, organic and whisper-close. Maybe there's a future film that will use size and sharpness to express an epic and intimate truth. Not this time.